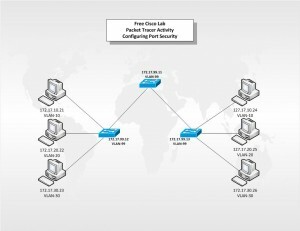 In this lab scenario we will use Cisco’s Packet Tracer to create an activity where we will configure and explore the operation of Port Security across 3 switches with 3 VLANs. You will learn to configure and view the default Layer 2 configuration and configure Port Security to limit access to the network via an individual switch port. Port security enables the switch administrator to prevent unauthorized devices from gaining access to the network. Port security is normally enabled on access layer switches for this purpose. This feature limits and identifies MAC addresses of the workstations that can access the port. When secure MAC addresses are assigned to a secure port, the port does not forward packets with source addresses outside the group of defined addresses. If a secure port reaches the maximum number of secure MAC addresses, a security violation occurs when a workstation that attempts to access the port has a MAC address different from any of the identified secure MAC addresses.